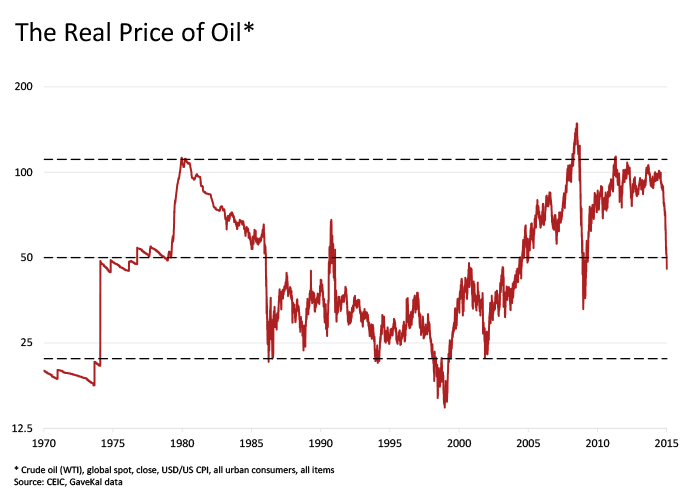 Since last year, the price of oil has approximately halved. Around the world, companies and countries are asking themselves whether we have already touched the bottom and started to bounce back or if the price will fall further. How long will prices remain low and will they continue to fluctuate? If so, what will be the range? There are no definite answers to these questions. But in thinking about them, it helps to understand what lies behind the price drop. There are three key explanations. 1. The fundamentals in recent months did not support the high price in the first place. Under this interpretation, it was a prolonged bubble that kept oil prices high for three and a half years. The bubble was kept inflated by two factors: projections of high future demand in emerging markets, especially China, and expectations of future difficulties in production. In reality, neither has materialized to the expected extent. Demand has not been as high as was projected, as demonstrated by the falling prices of other commodities. And in spite of a difficult geopolitical situation, production has been higher than many expected, in part due to significant amounts of North American shale coming on stream, with more to come in future years. 2. OPEC is understandably wary about cutting production. Bubbles stay inflated until something happens to burst them – and in this case it was the market’s realization that OPEC would not be the first to cut production in a bid to shore up prices. This is understandable on OPEC’s part – their fear is that given unfavourable market fundamentals, one cut in production would not be enough to stem the price fall, and further cuts would be needed. But cut too much, and they would merely lose market share to wealthier economies such as North America. Production will still fall, as oil companies are now making decisions to reduce their capital expenditure, but this will be a slower process. And OPEC may still decide to cut production, but the fact that they wouldn’t make the first move helps explain why the price has fallen so much. 3. Traders are playing a growing role in the oil value chain. In the past few years, traders have moved beyond trading and into the oil and gas value chain, taking significant positions in the storage of oil and also in the upstream and downstream sectors. In fact, in recent months the market has been in “contango”, which means that the future oil price is higher than today’s price. So buying oil now and storing it to deliver later for a guaranteed higher price is a straightforward decision. We could see the higher price of oil on the futures market as evidence that the market believes the bottom has already been reached. But there is another way of viewing the situation: there are physical limits on how much oil can be stored, and the current high demand for storage may be artificially preventing prices from falling even further.